Race #4 Drachten, the Netherlands, The Main Event by DHRA. Western Europe was suffering from a heatwave, and Drachten was no exception. Thirteen topgas racers on the entree list. The first round of qualifications at half past three was not attended by all racers, mainly because of the heat. Peter Niklas And Christian Bruhn arrived on friday evening with their turbocharged Honda, just in time to watch the last qualification session of that day. Gerd Caspari (picture above) had suffered wheelspin during his first attempt, skipped the second round, and improved in round three. 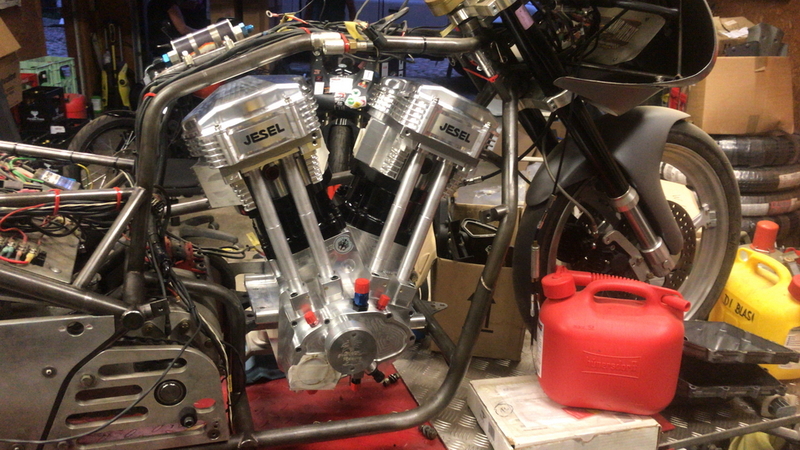 Shifting problems for Jan Malmberg (below), and his two compressors did not like the hot air. Martin Buehler from Switserland was one of the first to arrive, and used all the chances he got. Martin shredded his blowerbelt twice, but managed to make a big step forward and do a new personal best of 8.58 in round tree. He backed it up with 8.59. the next day. 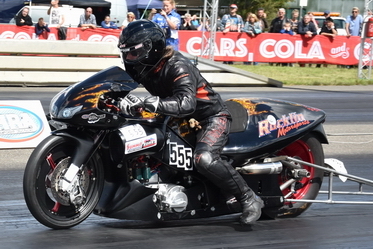 The former owner of the bike did a best time of 8.54 seconds on it, so Martin is almost there. 7.71 in round 2 and then a 7.8 for Joerg Lymant (picture above), top qualifier and a big gap with the rest on the list. Even Cord Albers (below) could not come close. Herman Jolink could not produce his usual numbers on friday, and had swapped the engine of the Ducati on friday night. A loose battery connector, but already a better start on Saturday. Olaf Menzi and his Swiss team were working on their gearbox on friday night. Strange noises were coming from the camshaft area of Mats Larsson's motor during warm-up, and his team was wrenching all weekend to find the cause. Anders Jensen is still repairing his bike and prepairing for Hockenheim, but came to visit with his wife and kids. And Anders also listened carefully to the noises coming from Mats' bike. Dark clouds packed above the airstrip when the topgassers lined up for the fourth round on saturday afternoon, and big raindrop came down when the second pair had started, so the whole session was cancelled, and all tried again at 18:00. when the thundershowers had passed. Meanwhile, Mats Larsson had payed a visit to Gert Jan Laseur's shop to get some parts to try and solve his problem. Albers and Malmberg improved while running side by side. And Peter Niklas entered the list with a 9.5, in the top eight with one more round to go. Malte Foit is at the bottom of the list, but he kept going quicker every round with his Rotax powered Buell. In the last qualification session, both Herman Jolink and Olaf Menzi improved their times. They both passed Caspari in the list, Menzi (in the foreground on the above picture) went quicker then Jolink (background). Olaf also passed Martin Buehler in the list, and went to place #4, while Jolink stayed at place #6. Malte Foit and Sven Ole Schleichert (foreground on above picture) also improved in the last round but it did not change their ranking. Bad luck for Peter Niklas. A hole in the Honda engine and he spilt some oil on the track. 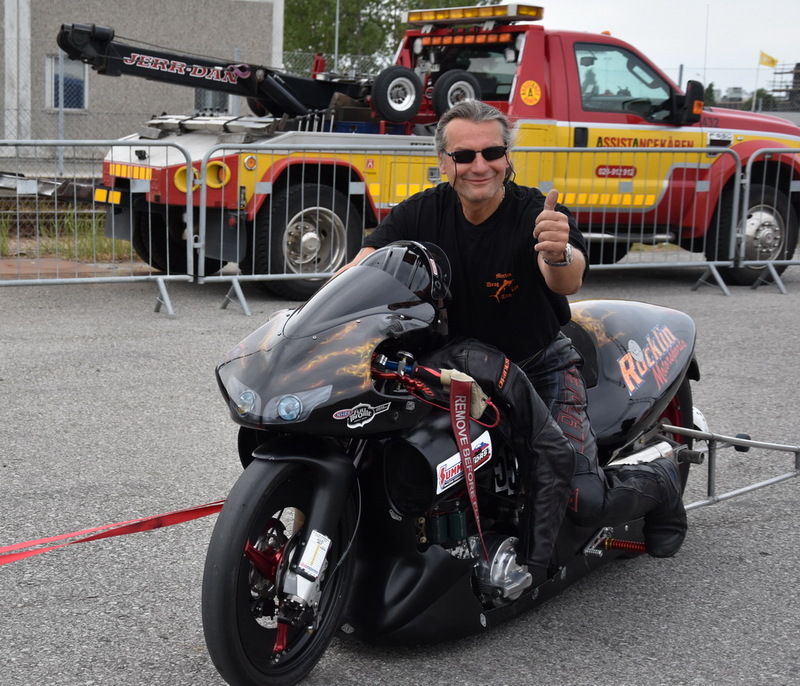 Jens Peter Hoffmeister had just recently bought his dragbike and had signed in for Drachten as test/demo rider, but the organisation had put him in the topgas class. Hoffmeister managed to qualify better then the Foit family, and was second alternate on sunday. With Niklas out, first alternate Schleichert came in against Lymant, so Hoffmeister was stand-by and race ready during the quarter finals. And allowed a test run afterwards. Sven Ole Schleichert was not able to give any competition in his run against Lymant, as his bike stopped at the launch. Swiss against Swiss in the second pair. Martin Buehler advanced while Olaf Menzi failed to stage. Cord Albers and Gerd Caspari are team mates. Caspari came close to beating Albers, who has the quicker bike. Gerd Caspari had the better reaction! Herman Jolink ran his best time of the weekend in the quarter finals and beat Jan Malmberg, who again suffered shifting problems. Martin Buehler's clutch got hot while staging for semi finals, forcing him to redlight, so Lymant advanced easily to the final. Cord Albers could not start up, so Herman Jolink also did not have an opponent. Herman's bike stalled right after he left the startline, but that was enough to advance. Lymant reacted better and beat Jolink in the final round. Jan Malmberg was allowed to make two test runs after being eliminated, and both of them were in the "seven", so he's hopefull for Hockenheim. Jörg Lymant won all races so far, he only needs to get technically inspected at Hockenheim to become the champion of 2018. Many thanks to Mr Koper and his crew for a smooth race under tropical conditions. See you all at Hockenheim, there are 17 topgassers on the entree list!